Year of the Labbit: To China! Pipkin and Domo enjoyed their time in Hong Kong and Macau, then headed off to Beijing, China. It was just a short flight but they were happy to be served ice cream. ...very cold, hard ice cream. Pipkin's tongue practically froze to it and it took a good half hour to eat his serving. 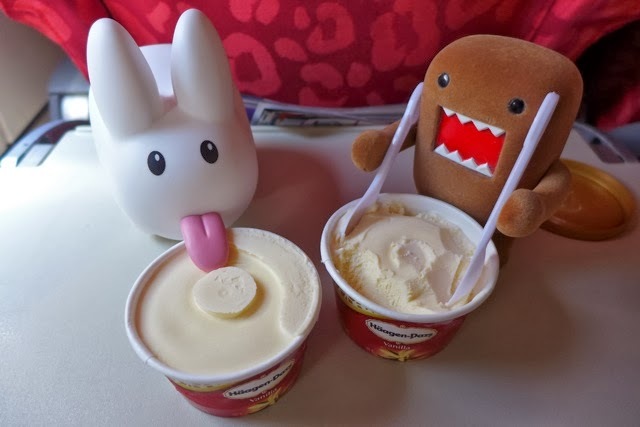 Domo wasn't so patient so he went with a double fist scooping method. One of these guys got an ice cream headache, I'll bet you can guess who! Haha! I was on a plane once too, and they also served us haagen daz!